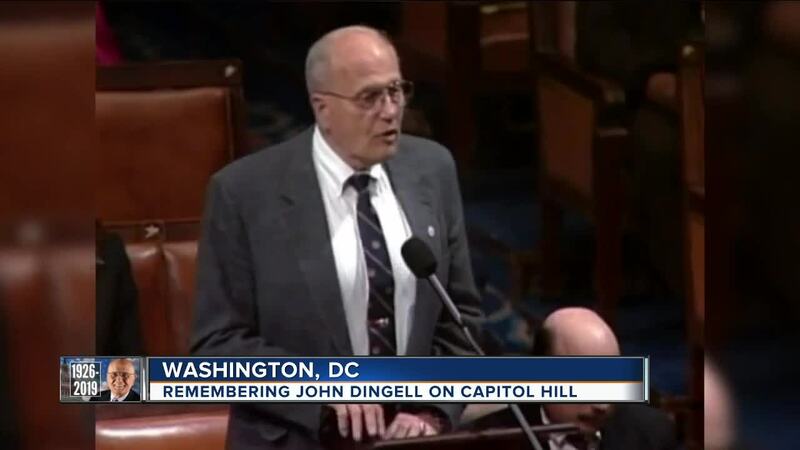 John Dingell spent so much of his life at the US Capitol – doing his best for Michigan. Now Washington DC is saying goodbye. (WXYZ) — John Dingell spent so much of his life at the US Capitol – doing his best for Michigan. Now Washington DC is saying goodbye. Dingell was the longest serving member of Congress – in history, serving the people of Michigan for nearly 59 years. On Wednesday, the Senators he mentored are remembering the Democrat from Dearborn who’s now being called one of the greatest legislators of all time. Heather Catallo spoke to him in Washington D.C.
"He was tough, he was no nonsense, but he also did it with a great sense of humor and that’s why people could not help to like him, even if they were in a tough legislative battle. You still liked him," Sen. Gary Peters said. With just hours to go until Congressman Dingell’s second and final public memorial service - Peters is mourning his mentor. "It’s kind of hard to think about that actually happening, because he’s been such a fixture here in Washington DC., and in Michigan, and has played such a large role in so much that has happened over many many decades," he said. Senator Peters says he will miss Dingells’ tenacity – and his humor. "I remember so many days when we had votes, some of them controversial I would look for the dean and congressman Dingell, sit down next to him, and get his sense of what was before us," Peters added. Peters says the Michigan delegation is also focused on comforting his widow, Representative Debbie Dingell who now holds her late husbands seat in Congress. "The one thing that everybody knew about the Dingells that they were a very special couple. They adored each other, they had each others back, I think they had each others thoughts many times as well," he added.